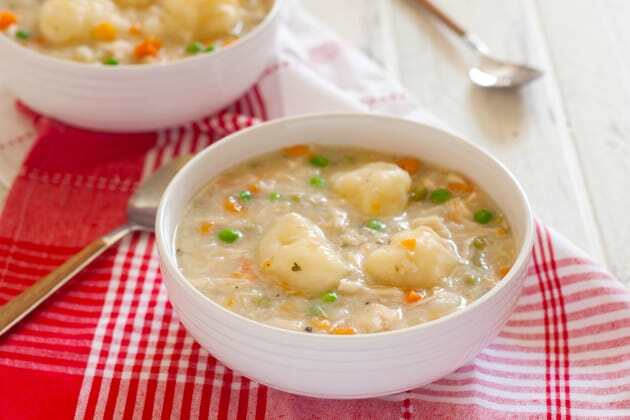 Gluten-free chicken and dumplings will warm your belly and your soul! This comfort food couldn’t be easier to make safe for everyone to eat. Nothing is more filling or comforting than a heaping bowl of soup. Especially if it is a heaping bowl of chicken soup. 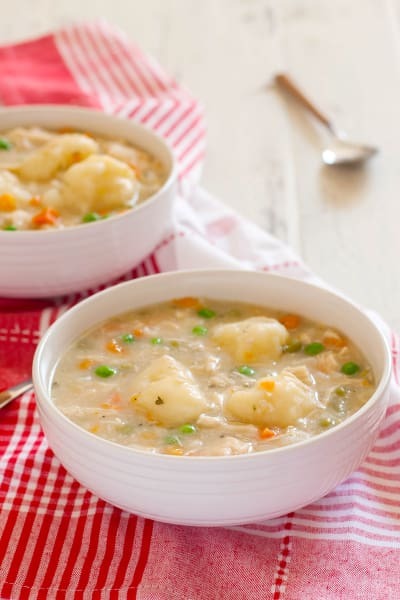 Or in this case, gluten free chicken soup with dumplings, a.k.a. 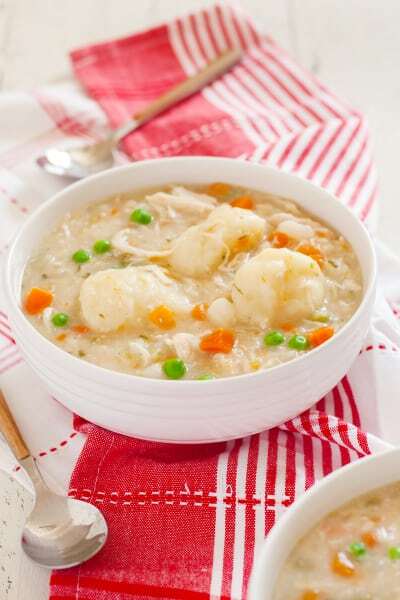 gluten free chicken and dumplings. Whatever you call it, your toes will be warm and your soul filled with every bite. Since I got my Instant Pot for Mother’s Day this year, I have been looking for excuses to use it. One of the first things I made was gluten free pulled pork with green chile slaw. I made pulled pork braised in a gluten free beer in LESS THAN AN HOUR! This is a game changer for me. So often I “forget” to get the slow cooker started until it is too late in the day and I don’t have time. My Instant Pot quickly (or maybe instantly, if that isn’t too “punny”) became my go-to for cooking dinner. One of my favorite things that an Instant Pot can do is sauté. I know, I know, I have plenty of skillets and a stove top. But an Instant Pot makes it super easy to sear meat or sauté veggies BEFORE pressure or slow cooking IN THE SAME PAN. When using my slow cooker, I always hated pulling out a skillet to sear meat before cooking it, so I would usually skip it. Now, I love building layers of flavor before I set and forget my dinner. Sautéing onions, celery, and carrots to make a homemade chicken stock (in less than an hour) is so easy now, and doesn’t make any extra dishes! I am dying to try some Instant Pot desserts! If anyone knows how to make my gluten free dark cherry lemon pie or gluten free death by chocolate cheese cake in an Instant Pot let me know. I love that my Instant Pot helped me make this from scratch gluten free chicken and dumplings recipe in less than an hour and a half. I will admit that I used the quick release. If you let the pressure come down naturally it will take a little longer. The dumplings are really easy to make too. I just whisked the ingredients together and used my cookie scoop to drop them onto the top of the chicken soup. The dumplings were soft and fluffy, and my favorite part of my bowl. I waited to stir the peas and carrots in until after the dumplings were cooked because I didn’t want them to lose all of their color. I just made sure they were thoroughly thawed by heating them slightly in my microwave. You can add them before the dumplings if you prefer, they just won’t be bright green and orange. 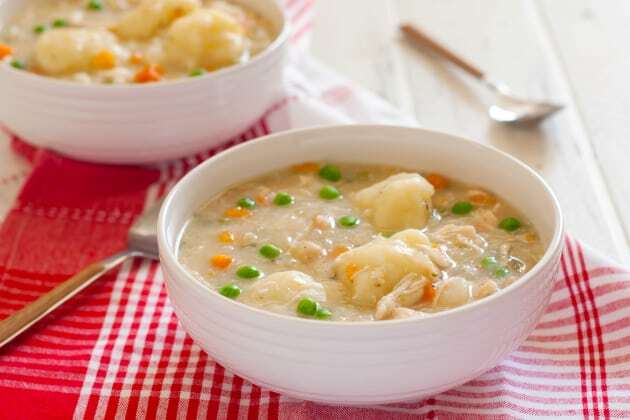 The flavors in this chicken and dumplings are simple, but a steaming bowl will warm your heart and soul. Dropping by to say thank you for this wonderful recipe. My family loved this chicken and dumpling combo. It was a perfect and timely. Hi Sheila, So happy my recipe was helpful to you and your family! Do you know if there some other flour that can be used? one that doesn’t contain potato starch? I haven’t tested with other flours, but it should work just fine with a potato-free gluten free flour. I recommend making What The Fork’s nightshade-free gluten free flour mix. I’ve used it, and think it would work great in this recipe. You may need to decrease the xanthan gum in the recipe to prevent the dumplings from being gummy. This is because the arrowroot starch is a bit stickier than potato starch. You can substitute cornstarch. I have been cooking totally GF for over 5 yrs., mixing my own flours. Husband has celiac. I use alot of cornstarch, white rice flour and others. Thank you for sharing what has worked for you! My experience has been similar, cornstarch will work great instead of either the tapioca or potato starch in this recipe. Can I make the gf dumplings without an instant pot? Absolutely! You’ll have to simmer the bones for much longer, at least a few hours, and then when you add the dumplings I would cover and simmer for at least 20 minutes, maybe a little longer. I made this recipe tonight, and for the most part I liked it. However, when I tried to make the dumplings they didn’t come together as the recipe instructed. I use Bob’s Red Mill 1 to 1 baking flour. I used the ingredients as stated in the recipe, but when I tried to bring the ingredients together the dough was still very dry and crumbly. I had to add more milk in order for it to come together into a dough consistency. While the end result is very good, the dumplings are very dense and chewy. I was wondering if you could advise an alternative recipe for the flour that I have. Thank you. I’ve run into similar issues using Bob’s Red Mill 1 to 1 baking flour. The issue is that my gluten free flour blend (that I make using Bob’s Red Mill’s White Rice, Brown Rice, Tapioca, and Potato starch) absorbs liquid differently. In many recipes where I try using Bob’s, I can get similar results if I use LESS of Bob’s 1 to 1. The recipe I’ve tested the most with Bob’s 1 to 1 is my gluten free sugar cookie recipe. Instead of the 3 1/4 cups of gluten free flour called for, I use just less than 3 cups of Bob’s. I’d recommend using at least half a cup less gluten free flour, when using Bob’s 1 to 1, and then adding more as needed so you get the right consistency. I actually would recommend this for making any gluten free recipe, and using any gluten free flour unless their is a gluten free flour specifically called for. Adding liquid to a too-try dough can make a product that is dense. And you can’t take away gluten free flour after you add it. Thank you so much for getting back to me. I will definitely try using less flour the next time I make this recipe. I’m still learning how to cook gluten free. I’ve only been gluten-free for just over a year.